MAP Marine Technologies, a developer of innovative autonomous marine navigation solutions for the unmanned surface vessel (USV) market, has partnered with Unmanned Systems Technology (“UST”) to demonstrate their expertise in this field. The ‘Silver’ profile showcases how their products can be utilised in a wide range of marine applications such as recreation, oil and gas, search & rescue, hydrographic survey, coastal defence and surveillance, security and target boats. 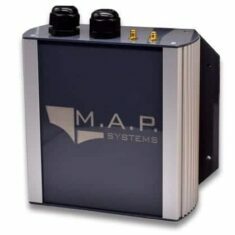 The MAP Pro Advanced Marine Autopilot is an ITAR-free commercial remote vessel control solution that allows any boat of any size, and with any propulsion system, to be quickly and easily converted to a USV, providing autonomous capabilities without the cost of buying a separate vessel. After installing the MAP Pro Advanced, users can remotely upload and manage pre-determined courses, and control the vessel’s throttle, steering and a wide array of third-party sensors such as radars, sonars and cameras. The MAP Pro can be used to control single or multiple vessels simultaneously. 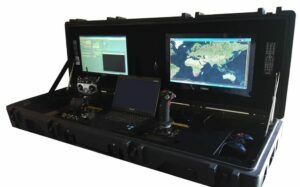 MAP Marine Technologies’ Ground Control Station (GCS) is a mobile command solution that controls unmanned operations for any USV fitted with the MAP Pro Advanced Marine Autopilot. Multiple display screens, integrated with remote vessel control systems, can be used to track and manage the operations of a single vessel or an entire fleet. The GCS can be seamlessly integrated into any existing command station, or can be provided as a standalone platform in many possible forms to suit any operational requirements. The GCS can be deployed as a laptop or in a rugged portable hardcase, or can be integrated into a vehicle or a cargo container. MAP Marine Technologies’ parent company Al Marakeb has also developed the B7 Security & Surveillance Unmanned Surface Vessel. This medium size fiberglass USV has been designed to provide marine solutions for a wide variety of military and commercial applications.